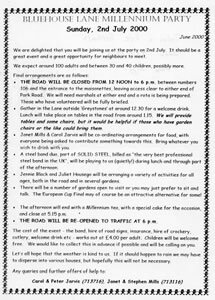 The Bluehouse Lane Millennium Street Party was held on Sunday 2nd July 2000. Below are two of the posters which were designed for the event. Click here to see the the pictures. holds an annual Fair on the green by St. Agatha’s Hall. Click on the dates to see the pictures. Betty Shearing made a photographic contribution to St. Peter's Jubilee Extravaganza. Now unavailable but it might be reinstated if the pics can be found.